For the second year in a row I NaNoed, I finished, and I finished early. To be fair, I am a self-described NaNo rebel; I didn’t write a novel. I wrote 25 essays (!) and worked on one short story which still remains largely unfinished. That short story is a disaster, more so than the essays. I have tasked myself with writing more short stories this year. Learning through doing. I didn’t write a novel during NaNoWriMo because I don’t have an idea for a novel. I write essays because I have lots of ideas for those. I’ll keep waiting for the novel to come. It may not. I may not actually be a novelist. That’s ok. But 50,000 words. 50,000 and change. Emphasis on change. 50,000 words don’t scare me. I am competitive, so I try to aim for more than the recommended daily 1667 words that it would take to achieve the goal by November 30. But also I don’t stop and I don’t edit. I don’t worry. The crafting of the story – the magic, the making it into something good – that comes from the hard work of editing and rewriting. This, this 50K hustle, is the childlike creative piece. This is where you just allow. This is where you dust those corners of your brain, releasing all the weird images and combinations of words. My job is just to capture them. Sometimes I dictate into the phone, not always to great effect. But if there’s one thing I’ve learned from improvisation, it’s to pay attention. With this are sister lessons of: go weird, trust, and sometimes you’re going to be terrible and it’s ok. The nice thing about writing is that it’s not like improv scene work. I get to go back, trim, add, subtract, and sometimes cringe looking at the nonsense of verbiage on the page. Sometimes my first drafts come across as the ramblings of a mad woman. And I’m learning that’s not always terrible. NaNo stokes the creative fires forcing dark hunts for inspiration, especially after those ideas I’ve been saving up have been exhausted (usually around Day 10). Anything can be written about. And anything has been written about. November is tough. 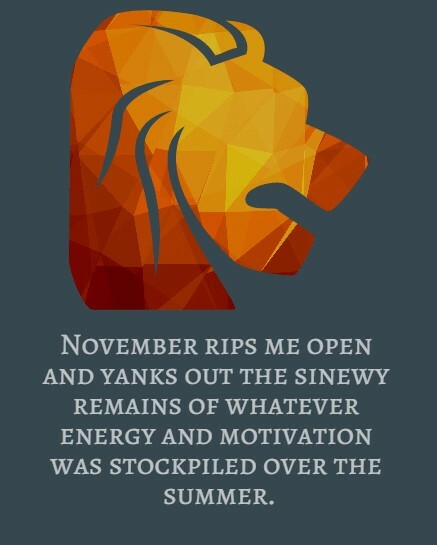 November rips me open and yanks out the sinewy remains of whatever energy and motivation was stockpiled over the summer. Not only are there the icy claws of the election, but I’m coming off a month of my husband’s birthday, our anniversary, and Halloween launching immediately into November’s gray work, my own birthday, Thanksgiving, teacher conferences, volunteer responsibilities, and life in general. This is compounded at least for the last two years by the fact that my children seem to get sick the week before Halloween and stay sick through at least mid-January. Germs do-si-do around my house, mutating enough to get re-caught and re-shared. I am never as exhausted as I am during their sick times. All the coughing, all the sneezing, the headaches, the tired eyes. I pay attention now and connections are made that haven’t been made in months because I have not made this commitment to myself. And that’s really what NaNo is. It is a commitment to myself costumed in self-abuse. It is waking up early or staying up late or squeezing writing in the middle of the day when all I want to do is close my eyes and not think. It’s the hunger to continue it is a hope for more time. It’s the sense that I’ve got to get it out, leave it on the stage because I just don’t know what life will bring me in the next moment.